9:30 - 10:00. Registration and accreditation for participants and press. 10:30. Guillaume Faye (France): “Euro-Russia: Concrete Bases for the Future Imperial Confederacy” (main report of the conference). 16:00 - 17:00 – Friendly greetings and other reports sent in advance; discussion. 18:00. Closing speech by Pavel Tulaev. Due to the length of David Duke’s speech (approx. 90 minutes), the speeches of Pavel Tulaev and Anton Ratchev were postponed to July 21. The same day Anatoly Ivanov read out the translations of the reports “Will is Victory!” by Pierre Krebs (Germany) and “Russia – the Stronghold of Europe” by Silvano Lorenzoni (Italy) sent to us in advance. The leader of the Forum gave publicity to the brief greetings of our comrades from Byelorussia, Ukraine, Poland, Greece and Germany. The report by Constantin von Hoffmeister, who suggested a cooperation of European nations with the state of Israel, as a possible ally on anti-Islamic front, caused a lot of controversy and became a subject for heated debate. The report by C. von Hoffmeister was severely criticized by D. Duke, whose views on the Jewry are well-known. 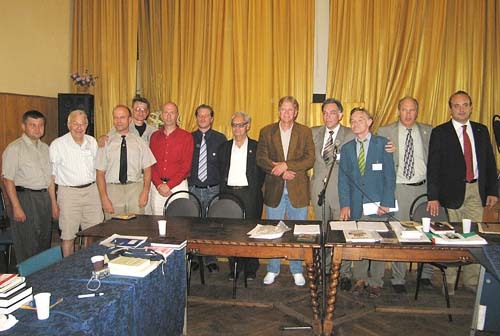 At the same time, G. Faye, M. Röder, S. Gekas, K. Roman and other delegates suggested, that it is better to concentrate on elaborating a positive program for pan-Aryan White Revival, and forming an alliance between Europe and Russia, rather than discussing the Jewish question. Several book stores exposed their literature in the assembly hall of the Russian Writers’ Union during the two days of the conference. The new books by Guillaume Faye: “What are we fighting for” [http://ateney.ru/Gijom.htm] and “Euro-Russia: Concrete Bases for the Future Imperial Confederacy” (in French, Russian and German) as well as the new issue of ATHENAEUM magazine (containing all the texts and documents of the “White World’s Future” Forum and other important publications in Russian) were most in demand. After the two workdays of the conference the participants had a dinner party at “Hemingway” summer café. After that they had free time for walking around Moscow, visiting the Museum of Constantin Vasiliev and seeing the organizers of the Forum. On July 27 a friendly meeting of a circle of colleagues with Guillaume Faye took place at “Intellekt” private school, rented by Moscow Institute of National and Regional Relations (MINRO). After a brief speech of our French colleague, every participant had a chance to ask Guillaume Faye a few questions. In the end, the rector of MINRO, Elena Kalashnikova (PhD), invited Guillaume Faye to give at the university a special course of lectures on modern international problems. The invitation was accepted with gratitude. Some time will be required for a more profound analysis of the Forum. We are planning to post the most important reports on the ATHENAEUM website together with the photos from the Forum by September 2007.